Rhodes - Ρόδος, the largest of the Dodecanese and the fourth largest Greek island (after Crete, Euboea and Lesbos), is a favourite port when visiting the south east of Greece and a very good starting point - much like Kos - for a sailing holiday in the Dodecanese. 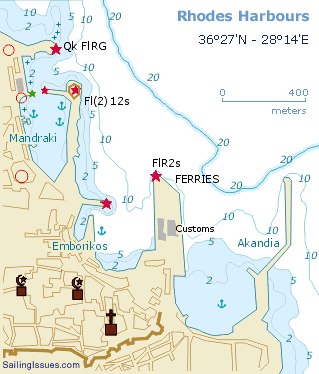 The island is roughly ellipsoid or diamond-shaped and a mountainous range runs from north to south with the highest peak Mt Ataviros (1205 m), situated in the middle of the west coast. Unlike many of the other islands in this region, Rhodes is fertile not only in the valleys but also on the higher slopes: pine, orange, olive, lemon, fig and pear trees thrive in these conditions. Also the villages are lush and colourful with hibiscus, jasmine and bougainvillea, which explains the many butterflies. 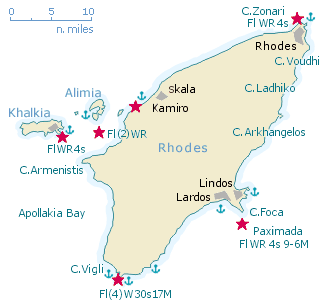 And indeed, Rhodes is often called the butterfly island. Rhodes was first inhabited in the Neolithic era. A major milestone in the island's history, which affected the fate of the other Dodecanese as well, was the founding in 700 BCE of the Dorian Hexapolis, a union of its three cities with Knidos, Halikarnassos and Kos. Its eco­no­my and culture continued to flourish until the 3rd century BCE, when it was the predominant power in the Aegean. When, a thousand years later in 1309, it fell into the hands of the Knights of St. John, it became again the centre of power, symbolized by its magnificent mediaeval town and the imposing castle and palace of the Grand Masters. 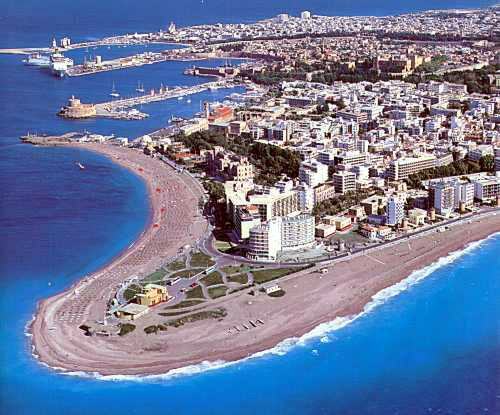 The capital, also called Rhodes, occupies the northernmost tip of the island. There are actually three cities on this site - modern, ancient and mediaeval. The modern town has a cosmopolitan character, many late 20th century buildings and hotels. The ancient town, which was founded in 408 BC according to plans by Hippodamos of Milesios (the first town planner), started from Monte Smith hill where the acropolis stood and extended as far as what is now the mediaeval city. All that left of it today is the ruins of the temples of Zeus, Athena Poliados and Apollo, the Stadium, Gymnasium and the Theatre, which has been restored. The mediaeval city is still surrounded by the high walls erected by the Knights. It is divided by an inner wall into two unequal parts, the smaller Collachio and the larger Burgo or Hora. Collachio is further split by the Street of the Knights, both of whose sides are lined with the sombre stone facades of the Inns of the Tongues or nationalities that belonged to the order of the Knights of St. John. Aerial view in SE direction of the three harbours. Approaching Rhodes by yacht one gets a first glimpse of the massive Old Town walls together with the graceful minarets and the arcaded waterfront markets with their exotic scents. The best place to moor your yacht is the Mandraki harbour, which features a tower with a bronse deer on top on either side of its entrance. Aerial view in S direction of Lindos. Lindos is dramatically situated on a promotory high over the sea, and is Rhodes' second town, with a year-round population of 800. With its cubed houses wrapped around the fortified acropolis, it has kept its integrity only because the whole town is classified as an archaeological site, unique in Greece. Aerial view in W direction of Chalki port on Khalki isl. With its Neoclassical pastel houses overlooking a horseshoe harbour, Chalki town is a miniature version of Symi. It is arid and rocky, and water may run short in summer. Chalki is famous for keeping its old music traditions alive. Tourism is still small-scale; fishing and goat-herding provides most of the income.